Error 807 for PPTP and L2TP is a general connection error that means it can be caused by high latency, port blocking or packet loss in your network. In some cases, the 807 can be coupled with errors 628 and 619. If the connection attempt fails due to error 807, try again to connect. In most cases, a few connection attempts are enough to establish a successful connection and solve the problem. The VPN 807 connection error has more to do with the VPN server than with your device. Error 807 indicates that a connection to the VPN server was lost simply because there were latency problems on the Internet or the VPN server had reached its full capacity. In both cases, the connection request is interrupted before even having the possibility to reach the VPN server. Make sure that the server to which you are connecting does not have a high ping time. Open the Server Location window (pin-drop icon), click on the update icon at the top right, and all locations on our server will be displayed. For optimal performance, connect to servers that display green ping times first, then yellow seconds. You should avoid servers with red ping times if connection problems occur. 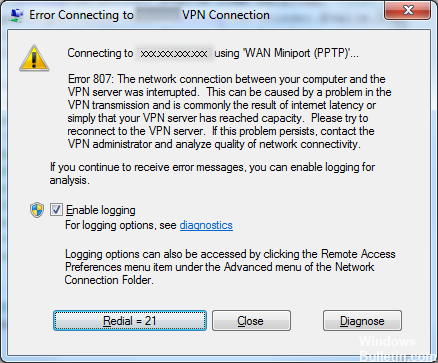 If you receive the 807 VPN error on your PC, the VPN settings can cause this problem. To solve the problem, you will see that you are changing the VPN security settings. Change the connection type to Point to Point Tunneling Protocol (PPTP). Check if the problem persists. Some clients recommend using the automatic parameter instead of PPTP, so you should try this too. If you receive the VPN 807 error, it is possible that the problem is caused by your firewall. To solve the problem, you must find your VPN client in your firewall and make sure that your VPN is allowed to pass through it. If your VPN is allowed to pass through your firewall, you can try to completely disable your firewall. 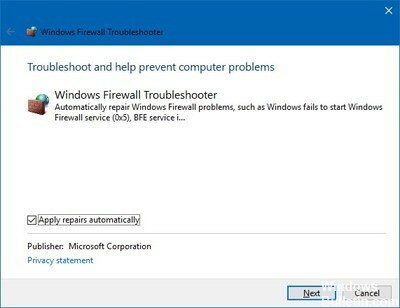 If you are using a third-party firewall, temporarily disable it and see if it solves the problem. VPN 807 Error The most common VPN errors are 619 and 800. If the above steps do not work for you, contact the VPN administrator and analyze the connection. If you have any further questions about the VPN 807 error, please comment below.